In January 2014, during the yearly CES (Consumer Electronics Show) in Nevada, Canon announced the launching of several new models of printers and MFPs with Wi-Fi. 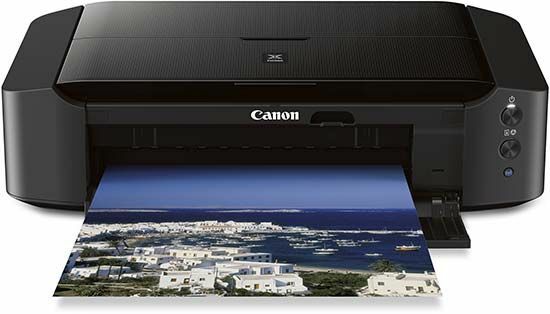 Among them—Canon Pixma iP8720, which is a wireless inkjet photo printer for wide-format output. The model is geared for home. Individual users now have an opportunity to print their photos and created craft projects sized up to 13 in x 19 in, without turning to a printing shop. The Pixma iP8720 produces the highest quality printouts, with every detail clear and the broadest color palette visual, thanks to its resolution of 9600 x 2400 dpi and 6-cartridge system. This unique system includes 6 individual tanks for different inks: cyan, magenta, yellow, black (for photos), page black (for documents) and grey, which works for beautiful color photos and stunning B&W images. And this all is sold under the estimated retail price of $299.99. The gadget has a sleek design, and its height of only 16 cm could be very handy at small space. The Pixma iP8720 has an access to Canon Creative Park Premium—an online collection of free printing resources (like cards, papercraft, calendars) for making original materials. Moreover, the printer features the wireless printing capabilities, thanks to AirPrint, Google Cloud Print and PPS (Pixma Printing Solutions) for printing photos and documents from a compatible mobile device. This entry was posted on Wednesday, February 5th, 2014 at 8:50 am	and is filed under Canon, inkjet, printer. "Adode Update: The 3D Printing Tools for Photoshop"
"LG Pocket Photo 2.0 – A New Printer To Take On A Trip"